Alan Ladd is an American movie actor who is probably best known for his starring roles in Westerns. He also appeared in a number of crime dramas and co-starred alongside actress Veronica Lake in at least seven films. Ironically both he and Veronica Lake died at the age of 50. 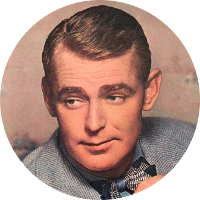 Alan Ladd has a number of historical figures in his family tree including signer of the Declaration of Independence Robert Treat Paine, American patriot Patrick Henry, Confederate General Robert E. Lee, inventor Eli Whitney, and Boston Tea Party participants Samuel Howard and Edmund Sears. His U.S. Presidential kin include George Washington, James Madison, John Quincy Adams, Calvin Coolidge, Herbert Hoover, and George W. Bush. Literary kin of Alan Ladd include Helen Keller, Jonathan Swift, Ernest Hemingway, Laura Ingalls-Wilder, Robert Frost, and Harriet Beecher Stowe. Royal family connections for Alan Ladd include a direct descent from King Edward I, and kinships to the current royal family including Queen Elizabeth II and the late Princess Diana.